Every now and then I find the urge to write more than the minimum 500 words … and this is one of those times. How much do you love your Adobo? Should it be considered the national dish? I love, love, LOVE adobo! It is so easy to prepare and so flavorful. Additionally, it keeps for days! 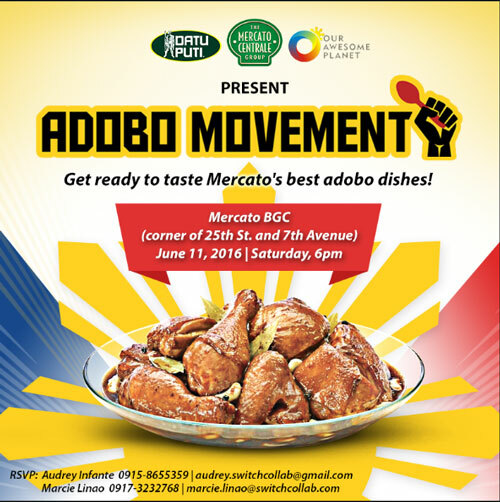 Co-presented with Mercato Centrale and Our Awesome Planet, The Datu Puti Adobo Challenge was part of the thrust to take the Datu Puti Adobo Movement a step further this 2016. 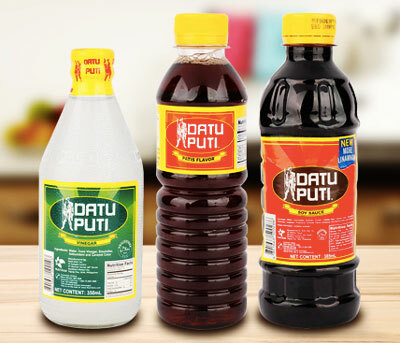 Launched in 2015, the Datu Puti Adobo Movement was created to push for Adobo to be our pambansang ulam. It is a movement that hits close to home because Adobo is a dish that is as personal, as it is national. Each household has its own signature Adobo, and the shared flavor defines families, identifies us as Filipinos, and boosts us as a nation. This event is also supported by partners Philippine Culinary Heritage Movement (PCHM) and the National Historical Commission of the Philippines (NHCP). Mercato Centrale was truly the right venue to celebrate this culinary heritage and mount the Datu Puti Adobo Challenge. The Mercato Centrale food fair is the go-to destination of urban foodies. Finding its home on 7th avenue and 25th street (across The Forum and in front of the “Between the Lines” art mural) in the heart of the BGC business district, this fab food fair happening every Friday and Saturday from 6 p.m. to 3 a.m. has earned the distinction of being a hub of culinary experiences. It is a venue for both comfort food cravings and fresh gastronomic finds all prepped by budding food entrepreneurs. During the Datu Puti Adobo Challenge, some select Mercato vendors added Adobo to their usual fare, and the foodies were all in for awesome renditions of the national comfort fave. The Oinkery’s Pugon Smoked Pork Adobo won 1st prize in the Datu Puti Adobo Challenge. Pork shoulder pugon-smoked for 8 hours, glazed with a rich Cebu-style adobo sauce and garnished with fresh manggang hilaw. 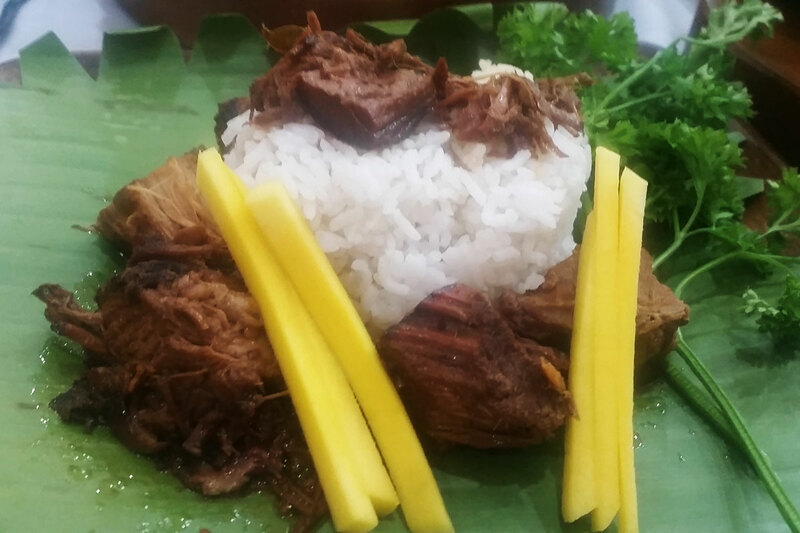 DESCRIPTION: Pork shoulder pugon-smoked for 8 hours, glazed with a rich Cebu-style adobo sauce and garnished with fresh green mango (manggang hilaw). I found their adobo flavorful and I loved how the meat was so tender that it falls off the fork. The mango was a perfect pairing for this dish. If it were not served with the adobo I would have ordered green mango shake from one of the other vendors. Here is the recipe of Oinkery’s Pugon-Roasted Pork Adobo. Roast meat in oven for 8 hours or until fork tender. Saute garlic cloves in cooking oil. Combine Datu Puti soy sauce and brown sugar in cooking pan and wait for sauce to boil. Add the Datu Puti vinegar and wait for sauce to boil. After boiling place the cooked meat along with the bay leaf and peppercorns. Serve with steaming hot rice and garnish with strips of Indian Mango. Dayrit’s Pork Adobong Laing Pinangat won the 2nd place in Datu Puti Adobo Challenge. This was my excuse to eat something healthy. 😀 I liked it because it was a vegetable dish and had an adobo taste. 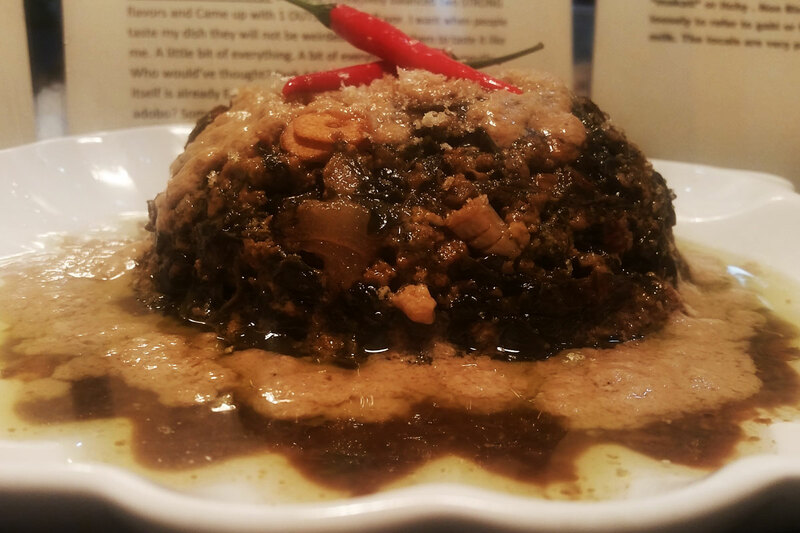 Here is the recipe of Dayrit’s Pork Adobong Laing Pinangat. Heat the sauce pot. Put in the garlic, pork kasim, Datu Puti soy sauce, Datu Puti vinegar, and Datu Puti patis. Simmer until pork is tender, set aside. In another sauce pot put the kakang gata over low fire, stir. Be careful not to make the gata too thick. 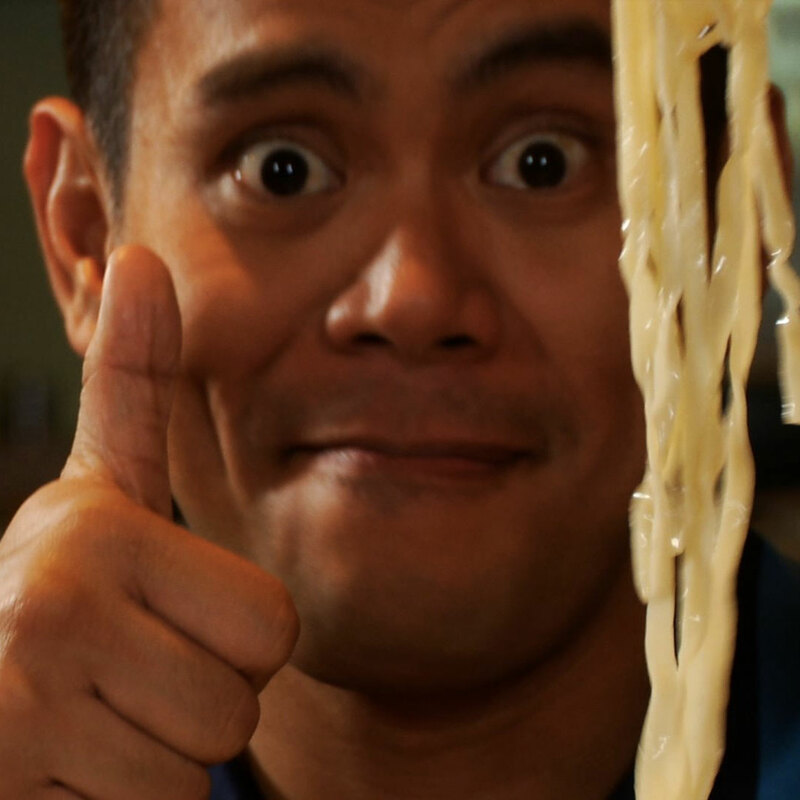 Pour in the Datu Puti soy sauce and Datu Puti vinegar and stir until it boils. Set aside. Place the pork adobo at the center of the whole gabi leaves. Put a little sauce and the gabi on top and the kakang gata. Wrap, using the thyme to secure the wrap. In a separate sauce pot put the mixed gata sauce with the wrapped adobo laing. Let it boil for 25 minutes, reduce the heat until the sauce thickens. Take off the thyme used for wrapping. Serve. 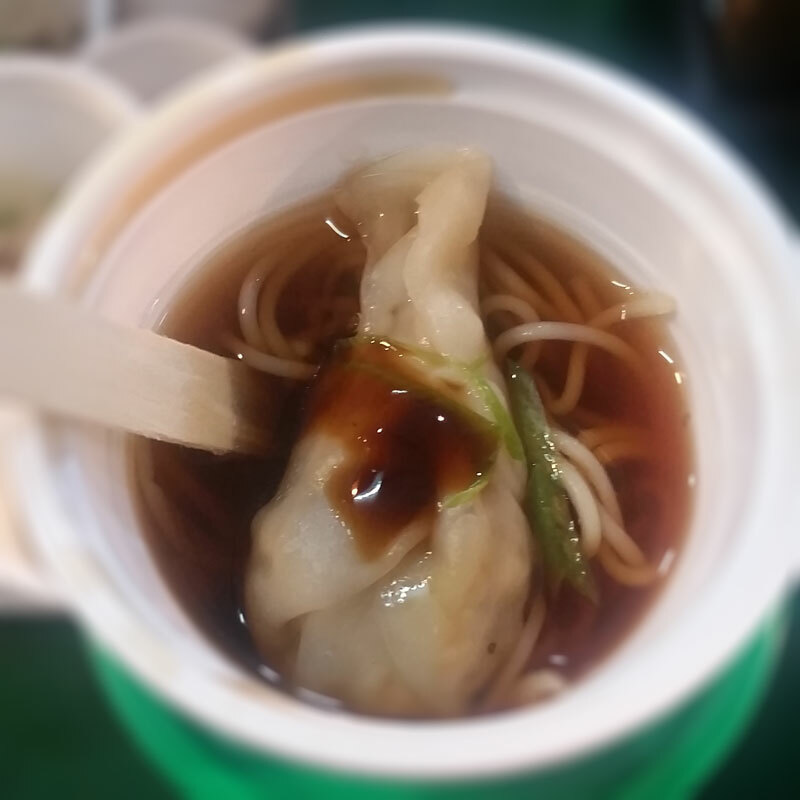 Bakmi Nyonya’s classic Filipino adobo infused with Indonesian spices and served with Sambal wowed the judges and won 3rd place at the Datu Puti Adobo Challenge. I’ve always enjoyed spicy food and growing up there was this restaurant not too far from my house called Rasa Singapura where we got our stash of sambal sauce. When I had the opportunity to taste this adobo dish by Bakmi Nyonya they immediately got my vote. 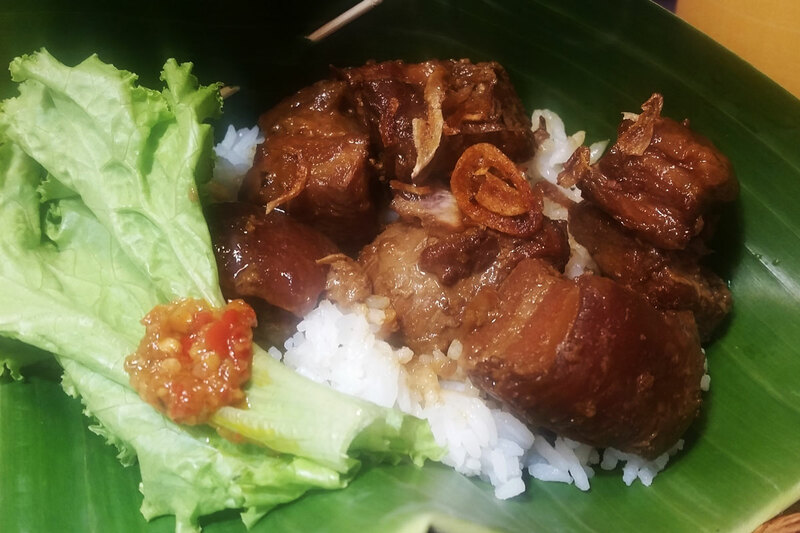 Here is the recipe of Bakmi Nyonya’s Babi Kecap Adobo Nyonya. Fry pork. Add shallots and garlic. Add a moderate amount, simmer. This was not among my favorites. I didn’t hate it, though. It was just ok. But, to be fair, part of my issue was allergies so I have to be careful when eating seafood. If not for that I may have enjoyed it more. Sadly, my personal favorite didn’t make it. Maybe most people found it too different? 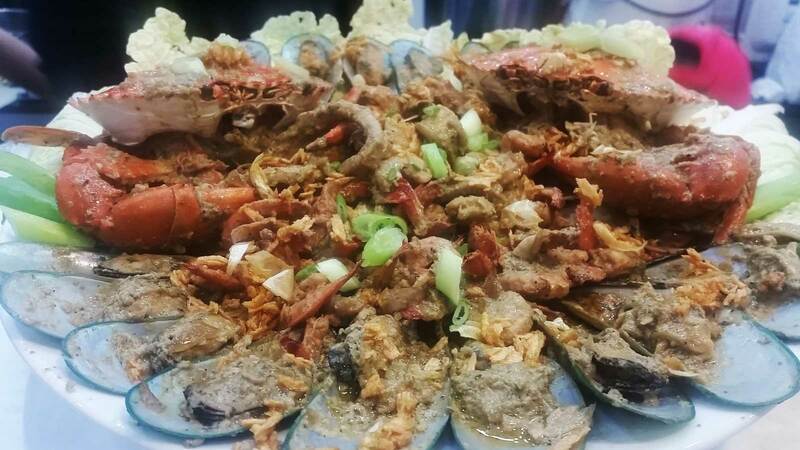 It is very different and not really easy to make but definitely very delicious! Curious about it? Here is the recipe for your enjoyment. Saute onions and garlic until brown and translucent. Add peppercorns and bay leaf. Drop the veal, pork, and duck bones and cook until browned making a nice caramelization on your pot surface. Add your Datu Puti soy sauce and vinegar and let it simmer. Add carrots, celery, leeks, and diced onions. Whip egg whites and add. Add warm stock and let it simmer for 2 hours then strain. Combine salt, flour, and hot water and mix until you form a dough and let it rest for 30 minutes. Roll into thin discs and set aside. Saute garlic and shitake mushrooms. Add Datu Puti soy sauce and vinegar and then simmer. Remove from heat. Let it cool and then add carrots, breadcrumbs, flour, and egg.